Eye-catching Christmas bulletin boards teach a lesson without speaking a word. Children, teachers, the workplace and even church goers look forward to seeing what new bulletin board is up especially during special times of the year. Church bulletin board ideas include the Christmas theme as the most important one. Be clever with paper and create this unusual Christmas tree. Use two- toned paper or glue two different coloured pieces of paper together. Cut a slit and curl the flaps on each side by pulling it over the blade of a pair of scissors or a knife. A message can be placed in the centre of the slits. This could be placed at the bottom or centre of the board. Cut out letters to make up the words ‘Merry Christmas' from coloured card and hang each letter on a separate piece of string. These letters can be attached across the top of the board. Alternately, cut the letters out of a magazine using different fonts. Christmas time can be used to help promote charity drives. One idea is to collect mittens and build the bulletin board around that theme. The mittens represent lending a hand and extending a hand to help. Make mitten shapes from cardboard or paper. Pin the pairs of mittens onto the board and spell out "Sharing Mittens, Sharing God's Love" in bulletin board letters for the title. State the dates the drive will run from and when it will finish as well as collection areas. Cover the board with light blue paper. Border it with silver tinsel. Letter "Christmas Helping Hands" at the top. Get people who are helping to make handprints by placing their hands in paint and making a print on paper. Make a brown tree stump and a yellow or gold star. Staple the hands, in tree fashion, to the stump. Add the star to the top. On candy cane shapes, write things that people for example staff in the workplace can do to help or serve others. Bulletin boards are a way to showcase creativity, therefore don't play it safe with the same old themes. Start a new theme that is different from the usual. Instead of doing a traditional snow themed Christmas, have a "Christmas is Paradise theme" in which Christmas is showcased as a tropical paradise with presents and Santa Clause. In order to make an old theme seem new, get creative and innovative. For example, if you are using a Christmas presents theme, don't use two dimensional cutouts of Christmas presents. Create three dimensional Christmas presents that actually open and or have presents inside. For instance you can consider making a board with the theme of Jesus with some of his pictures and in case you still want to use an old Santa Clause theme, instead of using a same old Santa Clause make a new one that is wearing different clothes or put him in a different setting. Don't be afraid to use outside elements for bulletin boards. Cut Styrofoam into squares of various sizes. Wrap each in Christmas paper and tie with a bow. Letter the board "Gifts from the Heart." Attach the wrapped "presents" to the board. Let everyone help tag the gifts with ideas of ways one can give without buying, such as a smile, a prayer, a kindness or a song. Use Christmas lights that actually plug in and light up. This will illuminate the board and save time over creating paper cutouts of Christmas lights. Use real pine cones, pines needles and branches to construct a realistic Christmas tree. You can also combine them all using pine needles, pine cones, branches and Christmas lights to make a realistic Christmas tree theme. The best teacher bulletin board ideas during Christmas involve making the board decorations only once and out of materials that allow the board to be used again as is or as part of another bulletin board display. The bulletin board ideas for Easter involve drawing people into the scene, inform, entertain and, above all, glorify Jesus. Monthly bulletin board ideas for the month of December involve decorating the board for Christmas. If you are having a hard time coming up with creative ideas, the internet also has a wealth of information and ideas on how to create the best Christmas bulletin boards. However, regardless of the use of the internet to gain inspiration you should be able to come up with ideas yourself. Remember to get innovative with whatever design that you choose. Follow the instructions for making christmas decorations to add a festive feel. It is fun to decorate your office at Christmas time to get everyone into the holiday spirit. Adding a few Christmas decorations will improve the overall mood of your office. You can provide employees with instructions for making Christmas decorations as a great group bonding activity. A Christmas decorating theme can make your holiday memorable. A theme can be anything, like a color, a decorating style, and a shape. You could choose a tree to enhance the entire Christmas workplace decorating scheme by using use different Christmas tree decorating ideas for example or easy to follow wreath making instructions. 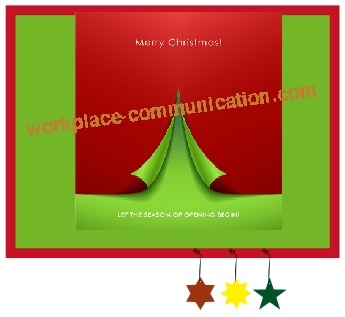 Your Christmas theme and be carried over to decorate staff workstations with free desktop themes and send corporate greetings to customers ipods. Christmas party themes is a popular concept in the workplace which add to the excitement of the celebration and bring some thrill into the party. You can pick any theme for your Christmas party, from the simple color based ones to the elaborate movie based ones. You can ask all the guests to come dressed in a specific color or dress, and decorate each and every thing, including the Christmas tree according to your Christmas party theme to create the perfect ambience to reward your employees or impress your corporate guests. The biggest thing that makes Christmas stand out from all the other holidays, is the decorating possibilities. The Christmas holidays are the best time for friends and family to get together and do fun things. Using instructions for making Christmas decorations and coming up with your own ideas is an enjoyable part of the festivities, and an activity that everyone can join in with. This can be applied to the workplace. Although you can buy an amazing range of Christmas decorations, they are mass produced, expensive and won't give you the satisfaction of knowing you made it. You can buy kits with instructions for making Christmas decorations which are simple, yet effective. Ensure that the instructions for making Christmas decorations are not too difficult or complex. Christmas decorations are easy to make, and there are many ideas for both tree and room decorations. Many of the ideas can be adapted to your workplace, so you can bring the festive spirit into the office. Encourage everyone to make at least one decoration each (supply instructions for making Christmas decorations where necessary) and that way not only will they all be different, but it isn't left to one person to do everything. Decide if you are going for a Christmas theme, or if you are decorating randomly but tastefully. There are many bargains to find at stores or online, and you can find cheap accessories to help you make your decorations. One of the easiest decorations to make, are the Christmas parcels. Simply find different sized boxes and wrap with colorful wrapping paper, tie ribbons around them and then place around the base of the tree. Another easy idea is Christmas stockings and stars, cutting out different size stars and stocking shapes from varied fabrics and paper. These could be hung from the tree, placed on the walls or even hung from the ceiling. A great idea for your workplace is to put up a festively decorated pin board, where colleagues can pin their Christmas cards, festive messages or wishes for each other. For specific workplace Christmas decorations, you need to remember that people do still need to be able to work comfortably. You can still achieve great results even by downsizing ideas. Installing Christmas wallpapers and screensavers on everyone's computers will get people in the festive mood. You could wrap your office door in wrapping paper, or place large Christmas bows on the back of people's chairs. Christmas plants like poinsettias always look great and if you vary the size then they can be placed either on desks on the floor. Even the usual office stationery can be ordered with a festive theme from green and red post it notes to Santa paper clips, these are all available to purchase. If there is enough room, then an artificial tree in the foyer of your workplace is a lovely festive decoration. It will give a fantastic first impression to visitors and will make you happy as you enter work. A tree is one area that every one of the workplace can get involved with. If everyone makes just one tree decoration then it will be decorated in no time, it will also be very personal to all of the staff. Tree decorations are simple to make and can be any design, style or size. For simple decorations, cutting festive shapes from paper and adding a loop to them, will look good on the tree. Or for more adventurous people you could sew fabric gingerbread men, or make dough candy canes.